The data-driven approach to talent acquisition hasn’t replaced the traditional resume and Q&A interview…At least not just yet. However, our research shows that when it comes to hiring more and more companies are eager to listen to what the numbers are saying. Supply and demand for a sample skill set within the US. 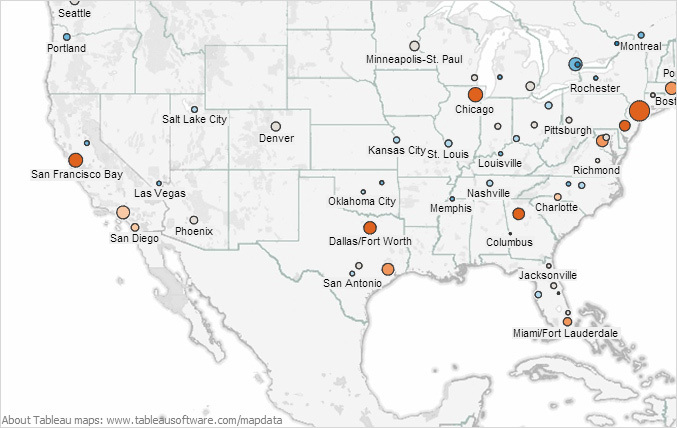 Larger circles represent more supply, orange indicates areas with high levels of demand. When a global tech company needed to hire a bucket-load of talent to staff their Austin, Texas office, they didn’t just flood job boards with ads and hope that something would work out. They consulted with the Insights team at LinkedIn to figure out where and how they could locate the numbers of new hires they needed. The tech company’s problem was that there weren’t enough candidates locally to meet their needs. By analyzing its data, and tracking the movement of LinkedIn users around the country, the Insight team was able to advise this company that their best bet would be to approach out-of-state candidates who had graduated from schools in Texas, or people living in states bordering Texas. The numbers showed that these people would be far more willing to relocate to the lone star state. Simple though this approach sounds, it allowed the company to move forward confidently with a new, more cost-effective hiring strategy. When Royal Dutch Shell needed to figure out a faster way to sift through hundreds of applicants to their Game-Changer department--a division of their company that seeks outside ideas for investment--they used an application designed by a company called Knack. Knack created a video game called Wasabi Waiter, which they claim can measures the player’s skills in a variety of areas, such as creativity, ability to learn from your mistakes and social intelligence. In studies at Shell, applicants were asked to play the game, and the candidates with the most successful ideas, were exactly the same ones who scored highest when they played Wasabi Waiter. By having candidates play the game, they were able to eradicate untold hours of time previously spent analyzing candidates and interviewing. 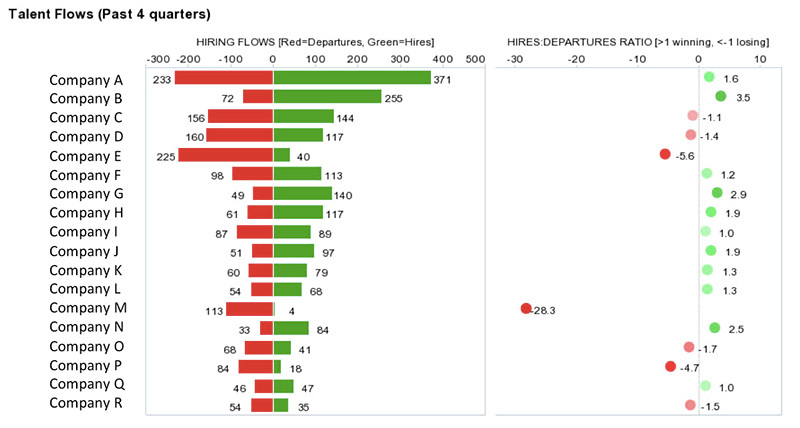 This Talent Flows chart shows how much talent you gain (green) or lose (red) to your competitors. “Talent Flows” show an organization which companies their employees are departing to work for, and when it comes to new hires, it also shows where their new hires are coming from. You can imagine a large company – let’s call them Gooplesoft – looking at that data, understanding where it’s gaining talent from or losing talent to, and adjusting policies, incentives and practices to increase retention. When Xerox decided it wanted to combat a high turnover rate at its overseas call centers, rather than changing strategies for retention, it contacted a small company called Evolv, to develop a psychological test that would screen for the right “type of personality” to work in a call center. The Evolv tests are created using millions of pieces of data about candidates that apply to jobs, those that are hired, and those that successfully remain in the position, and they assess for attributes pertinent to being successful in the position. In the case of call centers, it turns out the trait “rapport building” was highly conducive to a successful employee. By administering the Evolv test to candidates, Xerox was able to improve the call center employee attrition rate by 20 percent. Using data from LinkedIn Insights, companies can also determine whether their goals for employment are realistic, given what the data says is available. For example, if you’re opening a company that requires the expertise of a certain number of brain surgeons in a town in North Carolina, and the numbers show there just aren’t that many brain surgeons in that suburb in North Carolina, you can help adjust the goals of the stakeholders, by sharing a more accurate picture of what talent is really available.